It’s magic! You can take 12 volts DC from a battery and turn it into 120 volts AC ready to power all your devices. In fact, the more you know about how electricity works, the more impressive that magic becomes. The magic all happens in a device called an inverter. They come in different sizes – from something that might just power a small stereo all the way up to something that can run a whole house worth of devices. But wait: This doesn’t mean you can power your 60″ plasma TV, your popcorn-making microwave, and your 500 Watt stereo system from your starter battery while you sit in front of an electric space heater. Or, if you tried, it would be a short movie night and your van wouldn’t start the next morning. I’ve talked before about how 12 volts is less “pressure” than 120 volts. Your 120 volt appliances will want a lot more energy than the 12 volt starter battery is able to give. 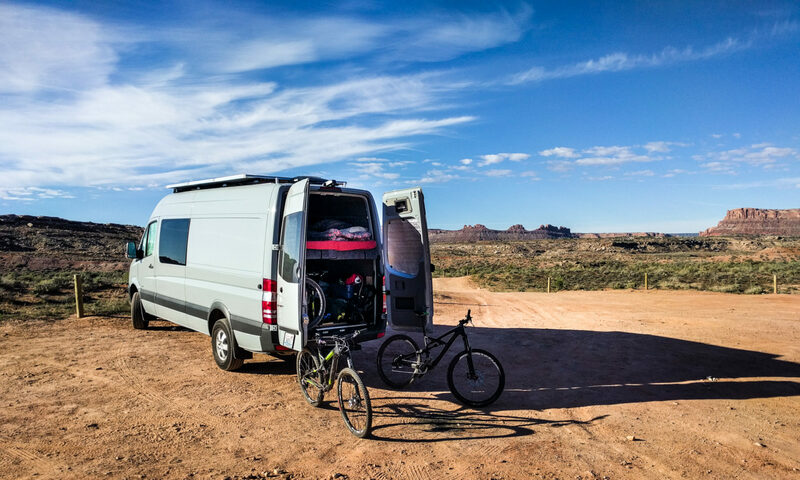 That’s why we added a dedicated battery for running things in the van that is around twelve times the capacity of a regular starter battery. Not that we’ll be putting a massive TV, sound system, or electric heater in the van. We have other forms of entertainment, and we’ll be using a diesel heater. But the point remains: inverters are awesome. We will be using a Victron Multiplus Compact, which is a pure sine wave inverter/charger. Pure sine wave output is important because some AC equipment gets upset if the alternating current isn’t as smooth as it likes. Microwaves and things with motors in them are especially sulky with modified sine wave or square wave inverters. In this picture you can see the “naked” inverter attached to the battery box. Next to it is the slightly smaller solar charge controller. The Victron we’ve chosen will power 2kW of equipment at once. That’s just about enough to run a small 700W microwave and a 1000W induction ring at the same time. The math sounds weird – how come it takes 2kW (2000 Watts) to run a 700W and a 1000W device? The thing is, the 700W rating is for the microwave’s output – how much cooking power it produces. It takes an extra 300W to make that much cooking power because the innards of the microwave need power to operate. Pretty much everything else in the van’s electrical system is sized around this 700W microwave capacity. The inverter has to be big enough to power the microwave and induction ring. 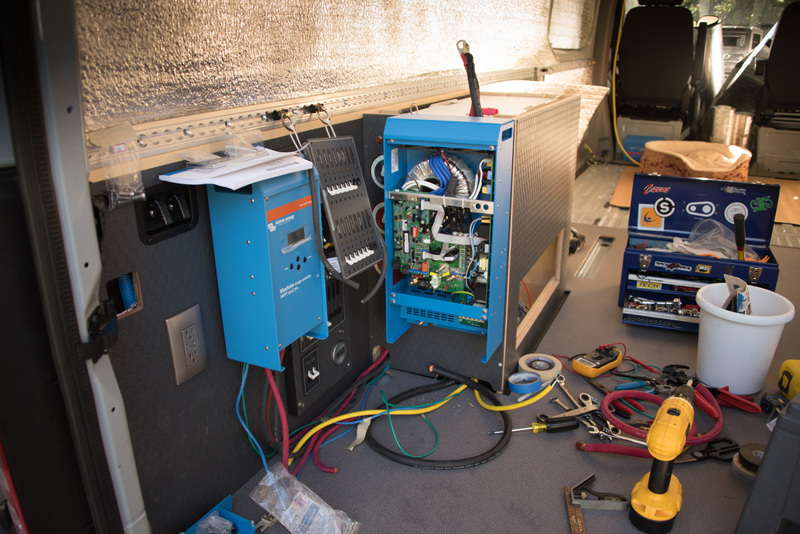 The battery has to be big enough to power the inverter for long enough to let us cook for a certain number of days. The solar system has to be big enough to recharge the battery. And so it goes. How much does the incerter consume at idle? Do you widh you had gotten a bigger inverter? We haven’t really found the need for a larger inverter, and you’d definitely need a beefy battery to keep up with anything more than 2kW. At idle it consumes very little power. It has a low power mode where it senses current draw with a pulse of power every second. I haven’t measured how much that averages out to, but I have no reason do disbelieve Victron’s literature. They claim 9W in regular mode, and 3W in low power mode. Does tue charger have the capacity to rake a feed from an aux generator for example? The inverter we chose has a single 120v input. However, it’s easy to wire with a relay or switch so that you can have two separate input sources. Larger Victron inverters do have two inputs. I have found no need to have an aux generator. If for some strange reason I did want one, I’d plug it in to the shore power input. does the inverter make any noise? During normal operation when you’re not using the van for anything, it makes no discernable noise. If you put your head right next to it and it’s on low-power mode (ready to invert, but not actually working) then it has a faint noise every three seconds or so as it sends out a pulse of power to detect whether it needs to switch on. When it’s bulk charging the battery the inverter makes a 60Hz hum. The fans can come on (but don’t tend to). The hum is loud to start with, then tails off as the charging tails off. When it’s actually inverting (creating 120v from the battery) for smaller loads it makes a little noise, but not so you’d notice. If you use it at full power, the noise is louder. Typically though, you are using it for a microwave or induction cooktop at that point. Either of those devices is louder than the inverter. As far as I know, there’s no such thing as a silent inverter in this power output range. I hope that helps! Brandon, we used 12 AWG SO style extension cables. They are flexible and the wires inside are made of multiple strands rather than one thick piece of copper. That makes them much better for a van where they are subject to a lot of vibration. We cut the plug and socket off the end of the cables. We crimped terminals on to the wires and attached the terminals to the outlet connector screws. Real dumb question here… getting my first van on Monday… 2015 170 ext 4cl…. I’ve seen where positive hooks up to the e28…. where does the negative go if you adding an investor? Donny, if you’re adding an inverter to the Aux battery terminals, you can put the negative wherever you want. It just has to be cleanly attached to bare metal on the chassis. The whole chassis is your negative connection! To make things easy for you, there are two negative bolts under the driver’s seat. Just find the places where the bundles of brown wires are bolted to the floor. Those are the negative locations that Mercedes uses. The second-to-last picture in this post shows one of the negative bolts on the floor underneath the location where the Aux battery power take-off location is. Just be careful not to use a large inverter with the stock aux battery. It’s really not designed to power an inverter.